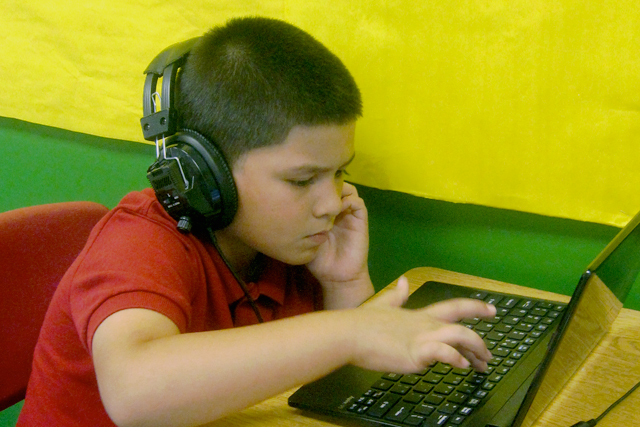 AUSTIN, Texas — Technology is everywhere at KIPP Austin Obras, a charter elementary school in Texas. One day at the beginning of the school year, first-graders grappled with math concepts as they tried to coax JiJi the penguin across the screen of their netbooks. Kindergarteners in a Spanish-language technology class learned to log on to their computers while second-graders did elementary coding on a Flappy Bird game, with one boy turning the birds into tiny Santa Clauses. But, when they talk about their school, which opened in August 2013, no one emphasizes technology. The children may focus on the snacks, the climbing wall and the nine-hour day. Parents discuss the dual language approach, and principal Matthew Frank and his staff speak about how small-group instruction is geared to individual learning. “We use technology as an add-on, not as a driver,” says Mike Kerr, who pioneered blended learning at KIPP. Kipp’s ramp up of blended learning, where students get personalized lessons, drills and feedback via a computer or tablet along with traditional whole-class and small-group instruction by their teacher, is a potential touchstone in education. KIPP is not alone in adding digital learning to the classroom, but by virtue of its size and reputation, it could spur many schools to replicate that approach. The move to digital has taken time for KIPP. Although some charter operators have plunged full speed ahead into virtual learning and other uses of technology, KIPP held back. “From the beginning we have always been very sober about the potential and limitations of technology to impact learning,” says Steve Mancini, director of public affairs at the KIPP Foundation. KIPP was not alone in its reluctance, says Michael Horn, executive director of the education program at the Clayton Christensen Institute, who has written about blended learning at charter schools. He says the very success of KIPP and some other charters may have made them hesitant. “When you are doing well, why introduce something risky without proven results that might upset the balance and cause you to backtrack? The risk often does not make sense, so charter schools were cautious. Until blended learning and education technology became more proven — or something that they were forced into for fiscal reasons — established charters were hesitant to dive in,” he wrote in an email. Other networks, such as Rocketship and Carpe Diem, have used technology to create spaces that look like call-in centers where more than 100 students work on computers in cubicles. KIPP, though, has taken a more moderate approach. Rather than blow up the classroom, KIPP schools “use blended learning to do what they do better, which is smart. They’re doing it exactly right,” says Horn. KIPP believes in having leaders at individual schools spearhead innovation rather than impose it from a central office, and grants them a fair amount of autonomy. As a result, different schools use computers in different ways. In Austin, for example, Obras has adopted blended learning but some other KIPP schools in the same region are still exploring their options. Many at KIPP think technology can contribute to making schools more successful by providing students and teachers with better and faster feedback, helping children practice skills and freeing up teacher time for small-group instruction. But they caution that computers cannot do it all. 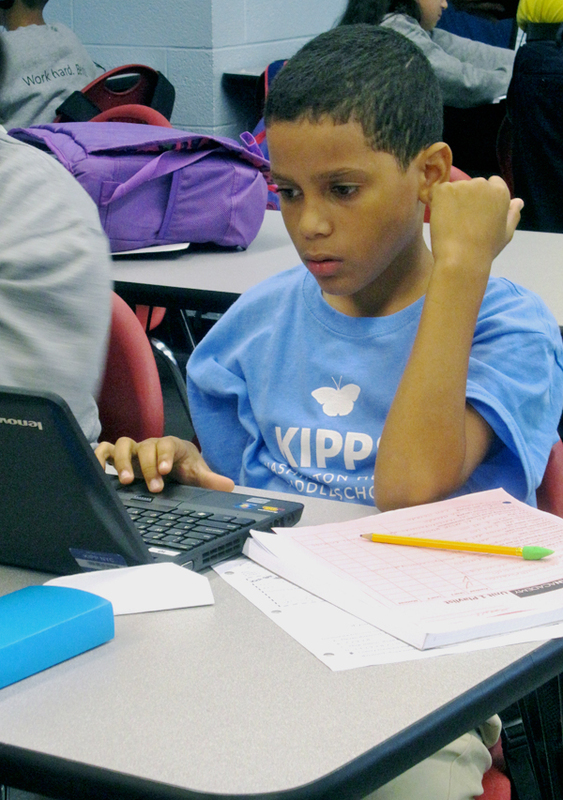 KIPP’s adoption of blended learning began in Los Angeles. Kerr, the founding principal of KIPP Empower who is now KIPP Foundation’s elementary school leadership development director, envisioned classes of 20 students each at the new elementary school he began planning in 2009. But when California made changes to a program that provided subsidies for districts to reduce class sizes, Kerr saw his class size would have to increase. “I didn’t want the added class size to adversely affect the quality of teaching kids would receive,” he says. Kindergarten and first-grade classes at Empower, which opened in 2010, have four classes with 28 students each and two extra teachers who rotate among the classrooms, according to KIPP. Although the specifics vary, students spend some time on computers in four key subjects: reading, writing, math and science. This allows teachers to work with the remaining students in a smaller group. After about 25 or 30 minutes, the groups switch places. Upper grades have about 26 students per teacher, KIPP says. There were glitches in Empower’s early days. The Internet in the building, which it shares with a district school, crashed when it rained. The staff struggled to find software that meshed with the students’ off-line work. And log-on cards provided to the children required passwords to be lowercase, flummoxing kindergarteners looking at an uppercase keyboard. In the years since it opened, the school has dropped some programs and added new ones, and made it easier for students to log on. By most measures, Empower has enjoyed tremendous success. It ranked as the top elementary school in Los Angeles on California’s Academic Performance Index in 2013, with 95 percent of students scoring proficient or advanced in English and 98 percent in math. With so many things going on at Empower, as at any school, isolating one factor as the cause of success or failure is almost impossible. Kerr and others say strong teaching is key, but technology can help. 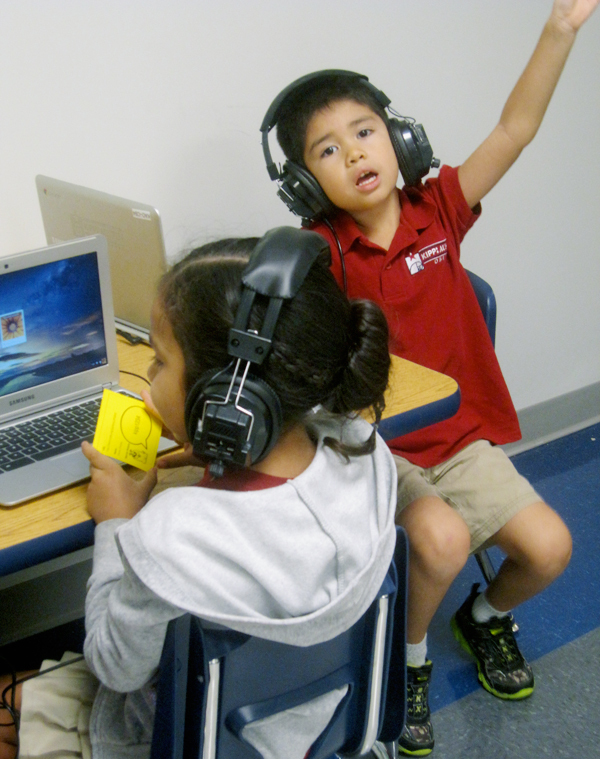 A 2014 report on blended learning issued by the Michael and Susan Dell Foundation said that technology was an asset at Empower and that even students who had never used computers — the vast majority of incoming kindergarteners — adapted quickly. “Six months into the year, students are not only logging in and navigating computer-based assignments, but appear to be more engaged in their work and progressing more quickly through the curriculum,” the report found. Beyond the scores, Kerr says he has been surprised by how successful the children are on computers, prompting the school to make additional changes. For example, students use Google Docs for writing assignments, so they can have more experience with technology and prepare for online standardized tests. It also makes commenting and grading more efficient. In art class, some students may work on a paper project while others learn to draw from an online tutorial by onetime PBS host Mark Kistler. “He has these ridiculously fun and almost outlandish tutorials where you’ll get a teacup drawing a dinosaur. You’ll have kids roaring with laughter,” Kerr says. The school’s story spread. “Empower turned a lot of heads in the KIPP network and nationally as well because KIPP is so high profile and the results there were so blow your socks off,” says Horn. Educators planning new KIPP schools visited Empower and began taking pieces of what Kerr and his staff had done and applying it to their schools. 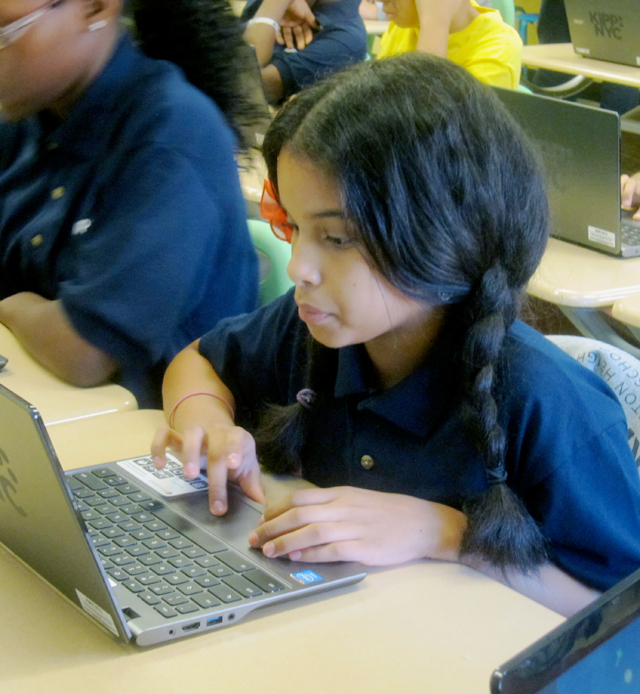 Now, four years after Empower opened its doors, other KIPP schools use computers to increase small-group instruction as students rotate between teachers and computer. Obras is one. 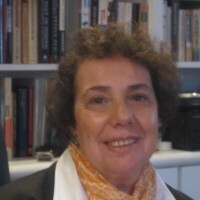 Frank received a grant from the Doris and Donald Fisher Fund, a longtime supporter of KIPP, to plan for Obras. Like other KIPP elementary schools in Austin, it would be a bilingual school. It would use the teacher partner model, with two teachers in every classroom — something difficult to do in California, because of the low payments from the state. And it would use blended learning. This fall, Obras (which means “works,” as in works of art, in Spanish) is in its second year and has 300 kindergarteners, first and second graders. About 85 percent of them are low-income, and 60 to 70 percent are English language learners. They will spend about an hour of their nine-hour day — three blocks of 20 minutes each — in front of their computers, mostly doing math and reading. On a recent morning, a first-grade class sat on the rug listening to lead teacher Rebecca Saxon and considering the day’s problem: “The class has 30 students. Twelve of them are girls. How many are boys?” After Saxon talked them through the problem, the children, white boards balanced on their knees, went to work, some drawing 30 circles and crossing out 12 of them. Then the students used electronic clickers to register their answers. A bar graph showing how many selected each response appeared on the screen. Most got it right. Most students on computers seemed engrossed. Bella Jaimes placed numbers in their proper place on a number line. George Gomez arranged a random group of numbers in correct order. A correct answer prompted JiJi the penguin to move across the screen. As their time on the computer ended, the groups changed places. But when the students return the next day they will pick up where they left off. And teachers have access to their online work and can see how far the child got and know if a student is stuck. As some children are on their computers, other students work with one of the two teachers in groups of five, according to skill level. Children having trouble with a concept might get additional instruction on it. Advanced students might explore the subject more deeply. Needless to say, there are challenges. On the second week of school, some students’ log-ons were not working. Others couldn’t master how to log on. “This computer is stupid,” mumbled one kindergartener, tripped up by the concept of the case-sensitive password. Early in the school year, many of the incoming fifth-graders at KIPP Washington Heights Middle School in upper Manhattan also were adjusting. More than 90 percent of the school’s students are low income; 86 percent are Hispanic. 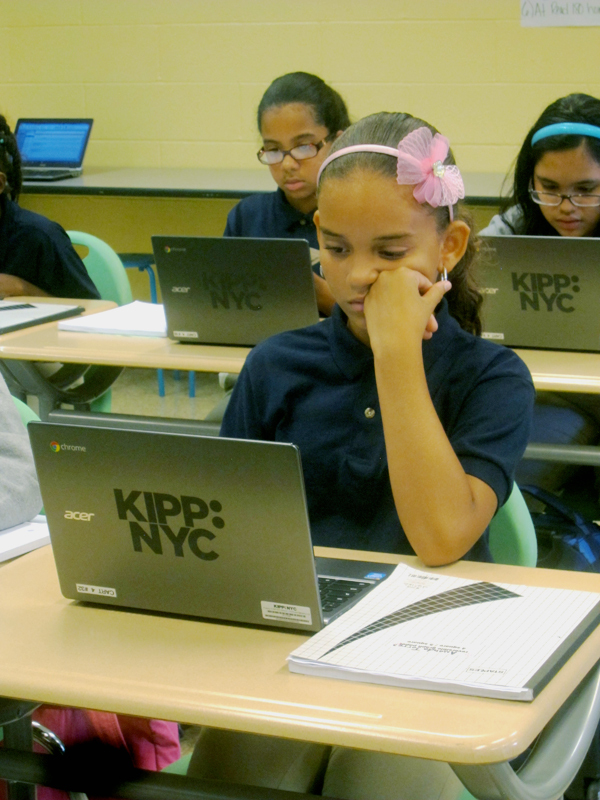 Most came to the KIPP school from district elementary schools and arrived at Washington Heights with widely varying computer literacy and math and reading skills. Students have two math classes. In computation, they work largely on their own at computers. Problem solving class is more akin to a traditional math class, but once a child masters the teacher-led lesson, he or she heads to the computer. Those who need more instruction get it, often in small groups. Both classes involve work on ST Math and Khan Academy, with their long stream of practice exercises. ST is more conceptual, with Khan providing more drills. Fifth-grader Ashley Alvarado is new to Khan Academy and likes it. “In my old school, it was too easy,” she says. Another fifth-grader, Lesliemars Rodriguez, also is a fan. “If you don’t know something, it can help you,” she says. Students have to complete activities on a playlist based on their needs and work required for their grade. But once that’s done, they can decide which program they will use and how to use it. “That’s a real important life lesson — to be sure you’re looking at data and making choices based on data,” says lead math teacher Silvestre Arcos. 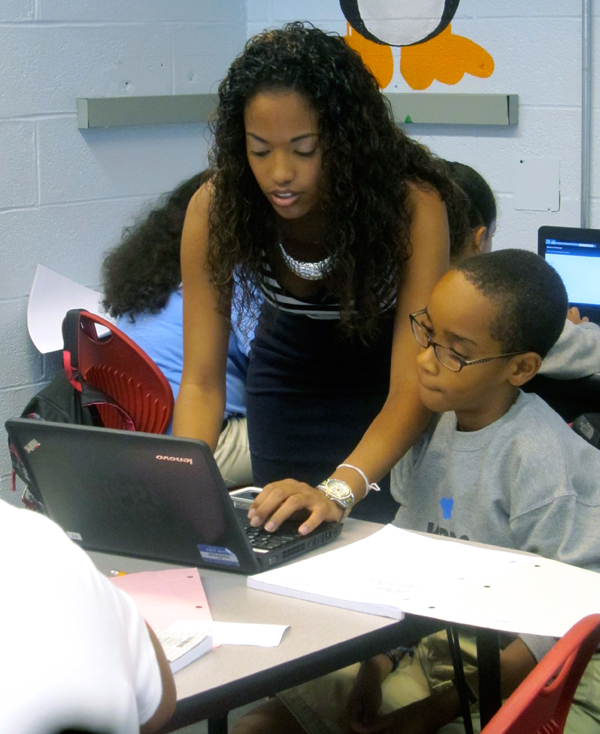 At Washington Heights, as at many schools, the online learning seems most robust in math. However, the school also uses a program called Accelerated Reader that quizzes students on what they have read and how many words a child has read. Children set goals for the month and win kudos if they meet those goals. Another program, Newsela, focuses on non-fiction, offering news articles adjusted to a child’s reading level. A former fifth-grade math teacher at KIPP, Swersky says that he thinks schools in general “do a really great job with kids in the middle.” But blended learning makes them better able to reach the others. “Kids who have never felt successful now have the opportunity to succeed and feel progress,” he says, while those capable of more advanced work can move ahead. “If in every class kids walk into they feel they are at their challenge point — not frustrating and not too easy — that’s what school should be,” he says. Washington Heights has seen mixed results. After a disappointing showing in math in 2013-14, the school pulled back on Khan, pushing children to go deeper into subjects rather than move ahead as far and as quickly as possible. It also added math projects, such as a scavenger hunt where students have to find items such as a house address whose digits add up to a prime number. Scores on standardized tests in math rose considerably in 2014. Reading scores, however, fell slightly. Partly in reaction to that, Swersky says the school now provides more coaching to teachers, has added a dean of teaching and learning, expanded the use of Newsela and made the reading curriculum more rigorous. KIPP high schools also use technology, although not as extensively as elementary and middle schools, according to Michelle Bruce, director of technology and technology innovation for the KIPP Foundation. At KIPP San Francisco College Preparatory, now in its second year, every classroom has enough computers for every student, but the teacher decides what to do with that technology. “I felt very strongly in founding the school that if we were going to be a blended learning school, we would only do it as a means to an end. It’s definitely not something we use for the sake of using it,” Gifford says. Those involved with technology at KIPP, as well as many outside experts, see blended learning as meeting a number of goals. Not only are the computer lessons geared to the child’s level, but the instant feedback on what a student is doing and the small groups allow teachers to be more personalized as well. At least for now, students seem excited about learning on a computer. Shyn’cere Jefferson, a second-grader at Obras is a fan of the Pretzel Goldfish he gets at snack time and the “cool math games” he uses at school. “It’s more fun to learn how to use a computer,” he says. It is difficult to know how many students will share her determination. One girl at Washington Heights struggled to add a number with decimal points to a whole number. In the practice problems, she aligned the numbers from the right, regardless of the position of the decimal point. So, over and over, Khan gave her response an X. She did not consult the video or ask for a hint. Asked about this, Arcos said the girl was working independently. If it were the regular lesson, he said, a teacher would have stepped in to provide support. Challenges, though, remain. While new software becomes available all the time, school can have a difficult time trying it out and finding exactly what they need. Math seems to offer the best software, but Bruce says there remains a huge need for science programs. The feedback, while more efficient than having a teacher hand grade 30 papers, could still use improvement. Swersky says that although all the programs have their own data dashboard, so far no mechanism exists to pull all of that data together. Related: Big Bucks for Blended Learning in K-12: Where’s the Evidence? Whatever blended learning can or cannot do, Calkins, whose organization has given money to KIPP schools, cautions against seeing it as a way to save money. “If cost savings are the motivating factor for any school to be moving in this direction, they’re doing it for the wrong reasons,” he says. This does not mean no one would do that. According to its staff directory, Carpe Diem Yuma, a 6-to-12 charter school in Arizona, has one teacher each in math, science, English and social studies — for 224 students. Using technology to cut costs could be particularly tempting for public schools on tight budgets and without access to the donations many charter schools receive. Yet hard evidence about the effect that blended learning has on student achievement at KIPP and elsewhere remains scant. Empower’s high scores seem to support its use of technology. There is little test data for Obras because Texas does not offer state tests until third grade, and the school doesn’t have a third grade yet. On the national Measures of Academic Progress assessment that all KIPP students take, 88 percent of Obras students met or exceeded target scores in math, and 74 percent met or exceeded target scores in English, KIPP reports.